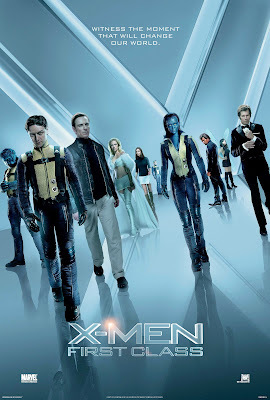 Mendelson's Memos: Review: X-Men: First Class is (pick one) eXcellent, eXquisite, eXceptional! Review: X-Men: First Class is (pick one) eXcellent, eXquisite, eXceptional! I have no idea how 20th Century Fox plans to fit X-Men: First Class into the mythology of the previous X-Men pictures. It theoretically works as a prequel to the first three films, even as it plays fast and loose with continuity. The vibe I'm getting is that Fox is hedging its bets. If the film under-performs at the box office, it will simply be considered a prequel to the Bryan Singer/Brett Ratner trilogy. But if it becomes a genuine smash hit, Fox will likely use it as a standalone reboot to shepherd a whole new batch of X-Men adventures. Whatever the case may be, as a singular motion picture, Matthew Vaughn's X-Men: First Class is a genuine triumph, a glorious piece of popcorn entertainment that contains nearly everything that should be expected of big budget genre entertainment. A token amount of plot: It's 1962 and mutants are living in secret amongst us. The CIA is trailing on Sebastian Shaw (Kevin Bacon), who may be attempting to play Russian and American forces against each other. After witnessing some inexplicable mutant powers from this international foe, Agent Moira McTaggert (Rose Byrne) recruits an expert in human mutation, Professor Charles Xavier (James McAvoy), who knows far more about the mutant phenomenon than he initially lets on. While Charles begins to recruit other mutants in order to confront this menace, one Erik Lehnsherr (Michael Fassbinder), a powerful mutant with a personal vendetta against Shaw, will enter the scene and change the face of mutant/human relations forever. The film runs about 126 minutes before credits, and it is the best kind of long movie. It moves at an almost leisurely pace, where every character gets their moment and the film has ample room to breathe. The film puts a premium on character interaction over big-budget spectacle. While Vaughn does not skimp on the action and special effects, everything feels organic and casual. There is little lingering on the effects, and the visual razzle-dazzle feels believable and plausible to the world in which it takes place. Some may carp that certain special effects aren't as photo-real or perfect as they could be, but the entire film has a 'believe your eyes' quality that makes its casual use of effects all the more effective. It feels less like a standard comic book adventure film than a character-driven spy film where most of the spies happen to have super powers. Like Nolan's Batman series, Vaughn does not settle for merely existing in the 'genre' of comic book adaptations. It is more a 1960s James Bond adventure that happens to have comic book roots. Basing the film in a variation of our actual world gives the film a fuller sense of stake and consequence as well. Unlike too many comic book films where the hero must stop a problem of his or her own making or confront an intrinsically personal conflict, this film presents a variation on a real-world catastrophe and allows its superheroes to save the world from an outside threat. What is most refreshing about the picture is that it exists as a politically relevant character drama first, an exciting spy caper second, and a comic book adaptation last. Like the best comic book films, X-Men: First Class stays true to the spirit and characters of the original comic lore while disregarding comic continuity for the sake of success as a standalone movie. But none of this would matter if the film did not work as a character piece, and that is just where the film is at its best. The X-Men universe has always been a science-fiction soap opera at heart, and Vaughn's picture puts the character relationships front and center throughout. The film also scores as an acting treat. James McAvoy and Michael Fassbender are the stars of course, and they deliver in spades. While the previous films have treated Xavier and Magneto as relatively ying-yang characters, one an omnipresent optimist and the other a cold-hearted villain with a sympathetic backstory, the shades are a little grayer this time around. McAvoy's Xavier is borderline naive, arrogantly using his mutation for his own amusement and failing to understand the difference between those gifted with invisible mutations and those unable to blend in with society at large. Xavier is a genuinely goodhearted person, and McAvoy makes Xavier's brilliance and kindness genuinely appealing. Xavier's flaw is that he believes that his open mindedness is representative of those around him rather than an anomaly. Fassbender gets the flashier role, playing a young-adult Erik as an embittered freelance Nazi killer who is unwilling to acknowledge the potential for decency in the human race, or even within himself. He is also far more sympathetic to his fellow mutants, especially those who feel the need to hide their physically-manifested mutations. The rest of the film is exceedingly well cast. Kevin Bacon brings low-key smarm to what amounts to a super-powered SPECTRE agent. His philosophy is similar to what Magneto will eventually adapt, altough he is far less concerned about collateral damage than the elder Magneto was in the prior pictures. January Jones alas gets little to do other than look gorgeous, and Byrne is undercut by a last-minute story turn that humiliates her character. But Jennifer Lawrence yet again proves that she is the real deal, as her Raven (IE - Mystique) brings a fragile humanity to what was previously just Rebecca Romijn in body-paint. The rest of the young mutants have their moment in the sun, although only Nicolas Hault gets a full-blown arc as the scientifically brilliant, but personally ashamed Dr. Hank McCoy. Oliver Platt doesn't get enough to do, but that's more about me being an Oliver Platt fan. And Matthew Vaughn fills the background with crusty veterans, and part of the fun comes from spotting various character actors in brief cameos ("Hey, it's Ray Wise!"). One particular cameo involves a pitch-perfect example of a PG-13 film using its one 'F' word to the fullest. The only truly wasted opportunity comes with the poor use of Edi Gathegi, who (slight spoiler) basically exists to perform that hoariest of horror film cliches. His big moment highlights the only real story flaw with the film. Despite being set in the 1960s, the film is far more concerned with making a Gay-Rights parable than with actually making any relevant statements about the Civil Rights and Feminist movements that actually took place in the 1960s. It undercuts Vaughn's choice to set the film in the 1960s, showing that it was more of a stylistic decision than a truly artistic one. The other core flaw comes at the very end of the picture, with an awkwardly rushed epilogue that feels the need to quickly put everything into place to reaffirm the status quo as established in the first X-Men picture. Quite frankly, the set up and character work is strong enough to have justified another prequel that specifically dealt with how Charles and Erik parted ways. The final on-the-nose moments play out as if Vaughn and company were afraid that they wouldn't get to play in this particular sandbox again. Issues with the political parables aside and a needless epilogue aside, the film works splendidly as a joyously entertaining adventure movie. The action scenes, when they do arrive, are expertly staged and edited with a clear sense of scope and geography, being both larger than life and appropriately plausible. There is a nice mix of quirky camp and deadly-seriousness (even aside from the Holocaust prologue, there is some shocking violence in the picture). With terrific acting, razor-sharp dialogue, and uncommonly assured direction, this X-Men reboot/prequel stands amongst the very best comic book adaptations. It is not just a great comic book film or a great X-Men film. X-Men: First Class stands proud as a just-plain terrific film. Scott, just a respectful heads-up, there is a typo in paragraph 5 which refers to McAvoy as "McCoy". I see the typo is fixed here. It still exists in the HuffPost version. Weird, as I fixed it there first just to be safe (it's easier to quickly fix typos here than there). Thanks for the tip. Hopefully the change will stick this time. 2nd to last chapter: "with a awkwardly rushed epilogue" , should be using "an"
And yet that was correct ('an') in the Huff Post version. So confused...!